This is a great little book. It is a pretty pink colour and in paperback and can be bought on Amazon if your local book store does not or can not get it. On Amazon it is under ten pounds. 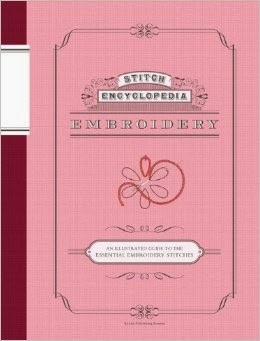 It is illustrated guide to embroidery stitches. It is great for beginners looking to build a a foundation of stitches and for experienced stitcher's who like a refresher occasionally, it is easy to use and is a beautiful book. It is one of three as there is one on knitting and crochet as well. There are different sections in the contents and one is tips and tools this covers such things as transferring designs, threads and their thickness, beginning knot and fastening off. There is a section on outline stitches but this shows you things like working curves and connecting beginnings and end. This truly is a book to put on your wish list for sure. As much as I embroider and mostly I use outline stitches, french knots and lazy daisy in different forms I often need a jog of my memory for a stitch that I do not use frequently so something like this is great on your shelf. When you are learning too it is good to see it so that is why I upload tutorials on here..... however once you know the stitch this little book is great to refresh you. It is a pretty little book with so much to learn.